When my husband and I visited Ireland in 2000, we fell in love not only with the friendly Irish people, but with their cuisine as well. We were startled by the sophisticated level of cooking, even in pubs we visited along the road of our 800 mile driving tour. This was right before the economy boomed, so we also had wonderful deals in restaurants, hotels and shopping in general. One evening, we had stopped at a small hotel during our tour of the Ring of Kerry. As usual, we asked the hotel for a recommendation for dinner. We loved the pub they recommended and the food did not disappoint. We swooned over our first taste of creamed leeks, which I promptly made as soon as we returned home from our wonderful vacation. You had probably heard folks warning about how dirty and sandy leeks can be, but this has not been my experience. In any case, once the leeks have been trimmed, just hold them under cold water, squeeze gently to allow the water to wash through them, and they will be squeaky clean. I added some lemon thyme from my herb garden and a little lemon zest from our first Meyer lemons to ripen this winter. 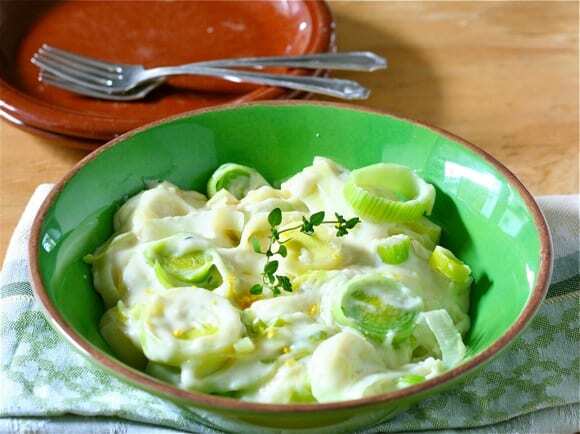 Creamed leeks, a dish inspired from our wonderful vacation in Ireland. Using a medium-sized heavy-bottomed pan, melt 2 tablespoons of the butter, then stir in the flour, stirring and cooking the mixture over medium heat for 2-3 minutes. Whisk in the hot milk and stir until sauce thickens and coats the back of a wooden spoon, about 3 minutes. Add the thyme, lemon zest, salt and pepper. Turn off the heat. Using a large skillet, melt the remaining 2 tablespoons of butter and add the sliced leeks. Cook over medium heat until leeks are soft but not browned, about 5 minutes. Add the sauce to the leeks, stir and reheat over very low heat, covered, for 10 minutes. This looks so good, Liz. Such a warming comfort dish. We were in Ireland a few years ago and had signed up for a walking trip around the Ring of Kerry, but Myles had back problems and we had to fly home to get him to surgery 🙁 I hope to get back there some day though! Until then, I can just have this dish! Wow, I just love this idea. Looks great. Love the touch of lemon. It must make the dish. Thanks, Elizabeth! We are so happy to have our new crop of Meyer lemons beginning to ripen – I use them in almost everything! I hope you both get back for a visit – we couldn’t get over how friendly folks were – and the food was glorious. These look and sound gorgeous. The lemon is a brilliant addition. So glad the Meyers are ripening on our tree, despite really cold temps the past 3 weeks. My friend this wknd who brought down the makings for bouillaibase including leeks said the exact same thing to me about leeks not being as dirty as we always imagine. They are growing on me and this looks like a lovely way to use them. Oh, yum! Cheese AND leeks! I need to show your recipe to my friend who is married to an Irishman. She needs to learn to cook like this! This is a lovely recipe! I have also fond memories of Ireland and the area around the Ring of Kerry. Killarney is a nice place. Oh how I love leeks. I’ve not tried them as a main component in a dish tho. I wish I could get my hands on some Meyer lemons!! Lucky girl. can’t wait to make this. Oh. My. Goodness. This looks so tasty, I need to try this! What a beautiful presentation, Liz. Kerrygold is one of my favorite butters. I’d eat it like most people eat cheese. And I wonder why I can’t shed my baby weight? Ha!